Am I the only person who feels like Google drops features into their application like they’re easter eggs? I recently clicked this arrow in Gmail, and discovered an incredible feature that I don’t think they informed users of (could be wrong). As it turns out, that’s where they hid the advanced search options. Spoiler Alert – They’re great! When was this added? I have no idea. 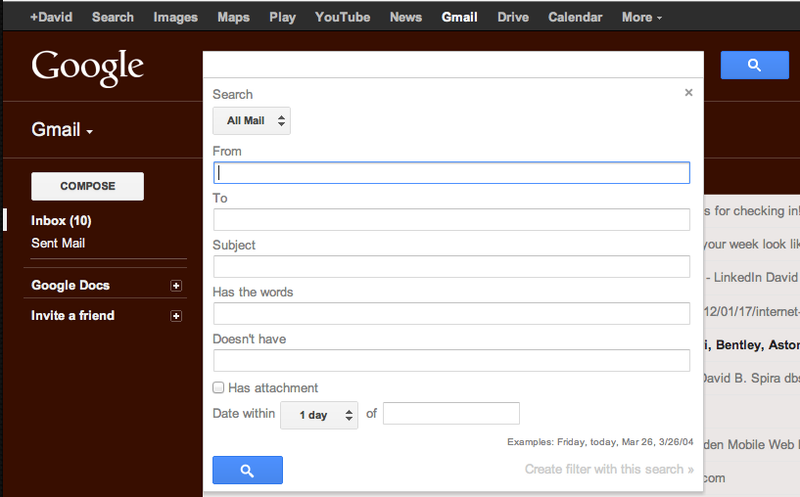 It could have been there since the New Gmail Beta, and I missed it. They do seem to add and change functionality on the fly. I’m cool with it, but I’d like to know that these features exist. Perhaps Google can put a “something new” call-out on the page, or just draw attention to some of the more obscure features. Do you know any of Google’s hidden features? Someone I know that works for Google says it’s more informative for them when you find it on your own. Makes sense. Interesting. That makes sense, but there is a point where too much research harms the user experience.